Discussion in 'Computer Audio' started by capnstabn, Dec 4, 2018. Back when I got my ModMic 5 I attached and sleeved the cable to my Mr. Speakers cable. It did look fairly clean but the cable weight went up drastically. I even had a cable management insert under my desk that helped support the cable, but it was still heavy and restrictive. 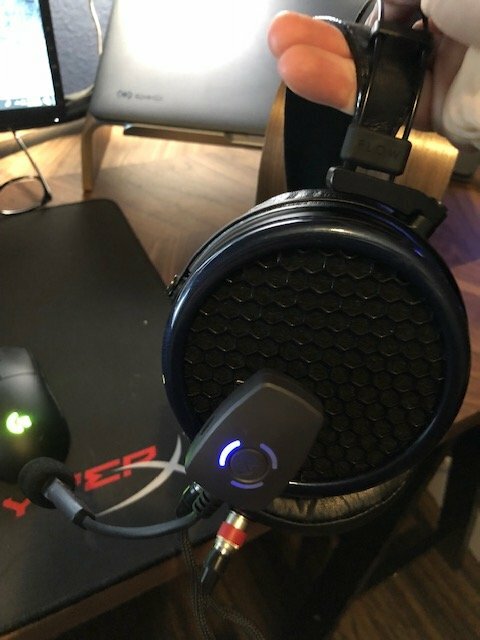 You do notice some weight with the ModMic wireless depending on your cans, but I would say the cable weight of the ModMic 5 made them feel heavier. Costs a premium at 120 bucks, but it does sound pretty damn good (even compared to my Rode Podcaster). Going to be playing some duos in Blackout tonight and will let you know what my buddy thinks. I purchased one. I really like my ModMic 4, and I've been looking for a good wireless attachable mic for a very long time. This product is the first of its kind, and I'm excited to try it out. I've always wanted a wireless version of the modmic, but I can't see myself spending money on just wireless. My 5 works fine. I can't help but wonder if sound quality is affected too much with your open design cans. The "base" on the earcup is blocking a good portion and will reflect some sound back inside the cans. Yeah the picture is a tad misleading. The mic is actually in front of my mouth as opposed to sitting off to the side. I think if you really had the headphones cranked you could potentially hear something, but the unidirectional setting does well. Didn't run into this with previous iterations of Modmic, or with the Audio Technica open headset. I did run into this with the Zalman clip mic though. I picked one up. So far I'm enjoying it. It holds a good charge and quality is great. Was glad to get rid of my Blue Yeti for this. I'm looking for a modmic5 if you guys upgrading to wireless end up selling one. I've got AKG 701s and Sennheiser HD 598. Mic quality is the best I've ever had. Battery lasts longer than any gaming session I've had. Not even a problem. Conveinence of wireless Mic basically means that any quality set of headphones doesn't have to be saddled with a whole other set of wires. I know this is a first world problem, but frankly it's kind of a game changer. I use this mic for work and for home...it travels with me wherever I go. And I sound super clear. Mic quality is a big deal for me. $120 is a reasonable price for a mic of this quality. The only reason I would part ways with this mic is if Antlion released a new revsion that was usb-c instead of micro usb to charge.